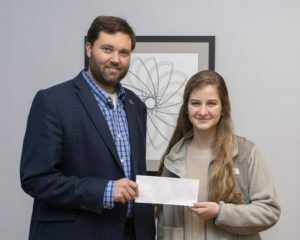 Anna Katya Opel receives a Scottish Rite Scholarship. 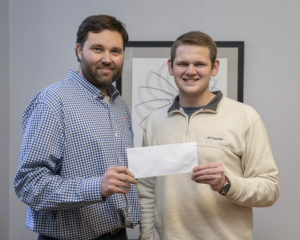 Two Louisiana Tech Civil Engineering students have earned the 2019 D. Walter Jessen, Sr. Civil Engineering Scholarship from the Louisiana Scottish Rite Foundation. Anna Katya Opel and Benjamin Robins earned the award for outstanding academic performance and extracurricular leadership in civil engineering. Benjamin Robins receives a Scottish Rite Scholarship. The D. Walter Jessen, Sr. Scholarship is awarded annually to rising junior or senior students enrolled in accredited Civil Engineering curricula at Louisiana colleges or universities and who are in the upper half of their classes, have demonstrated leadership capabilities in college and campus activities and show potential to become motivated, innovative, well-rounded and successful professional engineers.